From Ho Chi Minh City to Cedar Springs. 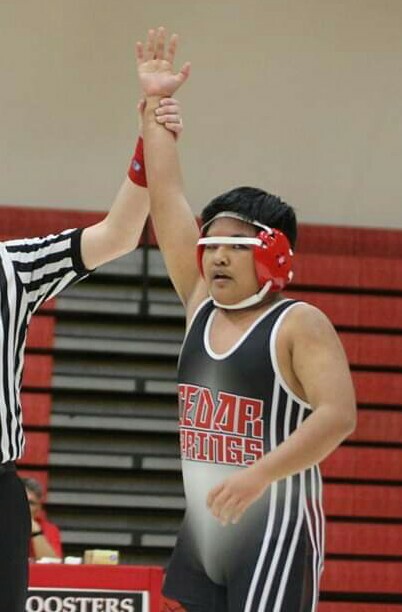 Exchange student Long “Jack” Nguyen has traveled over 8,500 miles to enjoy his first taste of glory on the mat as a Red Hawk wrestler. Courtesy photo. The varsity wrestlers said “Thank You” to their parents on Friday night by crushing Greenville and Ottawa Hills in O-K White competition. Arch rival Greenville buzzed into town tied with the Red Hawks for second place in the O-K White at 3-1. The Yellow Jackets jumped out to an early 18-0 lead but Cedar Springs went on to win nine of the next 11 bouts to claim a final victory with a score of 47-24. The Red Hawks followed up by defeating the Ottawa Hills Bengals 70-6. The senior class includes Logan Hull, Aaron Smith, Lucus Pienton, Anthony Brew, Ryan Ringler, Bill Hammer and Xavier Anderson.